This recipe makes two loaves. This is a dry, slightly sweet bread-like cake. 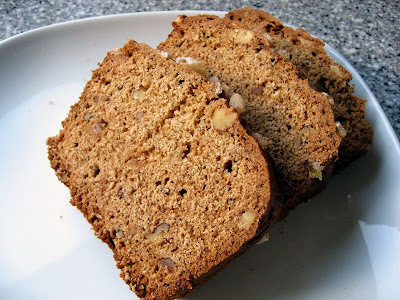 It has some textural differentiation due to the ginger and walnuts (you don't have to have either in this recipe) and as it is a rather dry cake it pairs well with tea or coffee. 1. Oil two 9x5inch loaf pans. 2. In a large bowl mix together the flour, cinnamon, cloves, baking powder and baking soda. 3. In a medium bowl whisk together the brown sugar, oil, honey, salt, and hot coffee. Mix until the brown sugar is dissolved. 4. Add the eggs to the brown sugar and coffee mixture, whisk until well blended. 5. Pour the liquid ingredients into the dry ingredients and mix with a wooden spoon until well combined. 6. Fold in the nuts and ginger. 7. Divide the batter between the two prepared pans. Smooth the tops with a rubber spatula, and if you desire sprinkle some crystallized ginger across the top for decoration. 8. Cover with plastic wrap and refrigerate for 8-24 hours. 9. Preheat oven to 325F. 10. Bake the cakes for 1 hour (at 30 min turn the cakes around so that even baking is achieved), or until well browned and when a thin knife is inserted in the center it comes out clean. 11. Let the cakes cool in the pans on a wire rack, then remove from the pan. These cakes keep for weeks wrapped in plastic in the fridge. 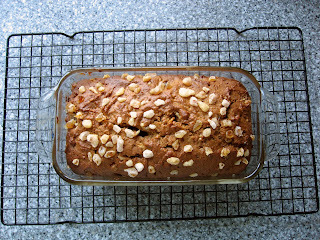 Taken from "A Blessing of Bread: Recipes and Rituals, Memories and Mitzvahs" by Maggie Glezer pp.153-5. RHID - can you email me at cathie@cathiewatchestv.com ? I want to ask you something. This honey cake sounds good.